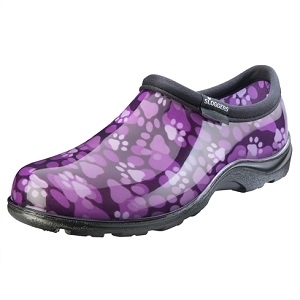 Be a hit at the dog park, or just running around town on a rainy day, with these Sloggers Made in the USA Waterproof Comfort Shoes. Like the rest of our shoes, they include our "All-Day-Comfort" insoles for maximum comfort and our signature deep lug tread for great traction. They are made from 100% recyclable material and the soles can contain up to 50% recycled material. Easy-on and easy clean-up, they are sure to become your "go-to" outdoor shoe. Made in the USA. Always was. Always will be. Women's sizes 6 - 11. Half sizes order up.